How to Get Search Results Targeted To South Africa? This is the main reason why Yahoo fails as a search engine in South Africa. In order to get local results you need to jump through a few hoops EVERY TIME you want to do a local search. Once in the settings find the “Country” option and change it to South Africa. I am not sure why Yahoo does not do this automatically considering we are in Yahoo South Africa… My guess is ignorance, they presume we want to see all their UK & US crap. Once these steps are followed you will be able to get some local search results however, you have to do this process every time as it does not keep your setting. For some reason when you change your setting to South Africa the nice Yahoo South Africa logo becomes Yahoo UK (very confusing) and Yahoo now adds the “pages from South Africa” option which should have been their from the start. You will also notice that Yahoo still adds their “only in UK” and “only in Ireland” options. This is stupid in my opinion as we have just told them in the advanced settings that we want SA results. Looks like one big developer’s flop. 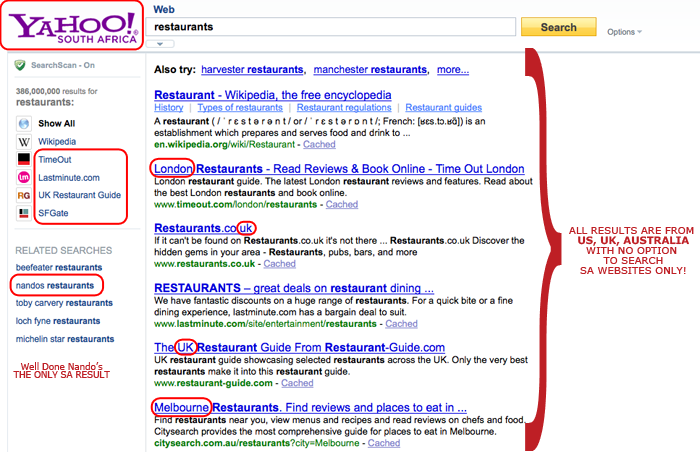 Yahoo or should I rather say Bing has no regional search capabilities hence the stange organic results ….